ADDITIONAL CONTEST RULES OF THE WILQ Q-CAMPER GIVEAWAY WITH RHONE’S RV AND JAYCO TRAVEL TRAILERS! The official contest rules apply unless otherwise noted. There are 4 separate and unique ways to win a WILQ Q-CAMPER GIVEAWAY Key Registration Card. 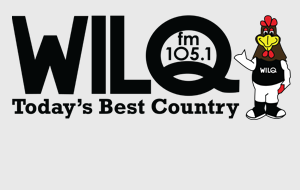 –Every weekday around 7:20 am Ted Minier will play The WILQ Q-CAMPER GIVEAWAY Key Song Of The Day. When it’s heard be caller number 10 at 570-322-6011 or 1-800-377-1051 and you’ll win your key registration card. The key song of the day could play multiple times between that initial play at 7:20am and up until 7:00pm weekdays. There will be no key registration card awarded for the initial play at 7:20am unless otherwise noted. –WILQ special broadcast opportunities. We will reveal where and when we may be at a specific location at a specific time for opportunities to register and instantly win your key registration card. Listen to 105.1 FM for details. –Become a member of WILQ’s Country Club. Get all the details on how to join the club at www.wilq.com. We’ll do one or more random drawing(s) from all club members on Wednesday, June 5th. –Register to win at an official WILQ registration location. Listen to WILQ for locations or visit www.wilq.com. Winners will be drawn from each location on Wednesday, June 5TH 2019. Only one qualified finalist per household will be allowed. 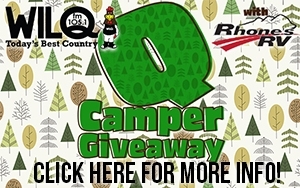 Finalists must bring their Q-CAMPER GIVEAWAY Key Registration Card between 10:00am and 12:00pm (noon) on Saturday, June 8th, 2019 to the WILQ booth at RHONE’S RV at 4368 LYCOMING CREEK ROAD, COGAN STATION 17728. If for some reason a finalist or their pre-approved substitute does not pre-register by 12:00pm (noon), they will be disqualified. You must have your registration card and proper photo id to participate. (Call us 9:00am – 5:00pm weekdays at 570-323-8200, if you have any questions). Then on or around 12:15pm finalists will be randomly chosen for their chance at choosing a key and then trying their key in the WILQ Q-CAMPER Lock Box. OF OUR 105 KEYS, THERE WILL BE 13 THAT UNLOCK THE BOX! IF YOUR KEY IS ONE, YOU WILL GET THE OPPORTUNITY TO CHOOSE ANY OF THE 13 PRIZES ASSOCIATED WITH THE GIVEAWAY…INCLUDING THE JAYCO TRAVEL TRAILER ITSELF. This will continue until all 13 prizes have been claimed! — A JAY FLIGHT SLX 21 FOOT TRAVEL TRAILER WHICH INCLUDES A KITCHEN, BATHROOM AND QUEEN-SIZE BED FROM RHONE’S RV…AND 10 NITES OF CAMPING FROM RIVERSIDE CAMPGROUND IN MONTGOMERY! –A CUB CADET CORDLESS CCT400 TRIMMER FROM KEN BERGREN INC.
–A WALLENSTEIN EC2000 GENERATOR FROM C.H. WALTZS SONS, INC.
— 2 TICKETS EACH TO SEE THOMAS RHETT, JASON ALDEAN, THE ZAC BROWN BAND, DIERKS BENTLEY & FLORIDA GEORGIA LINE IN CONCERT THIS SUMMER AT HERSHEYPARK STADIUM AND MONTAGE MOUNTAIN! *Prizes may change or be deleted. Pick up and/or delivery of prize(s) are the responsibility of the winners. The winners are responsible for all local, state, federal taxes, titles, tags and registration fees that may be required. See #11 on official contest rules for additional information that will be needed from the winner. No purchase necessary. You must be at least 21 years of age with a government issued photo I.D. For more info check us out online at www.wilq.com.